Welcome to my Irish Author blog, Fran. Like many of my author friends on this side of the Atlantic, we first met at an Irish Festival. We had author tables in Baltimore – yours was spectacularly decorated! FP: I remember our first meeting well, J.P. It was November 2016 and it was the first time I had worked the Maryland Irish Festival and had no idea what to expect and was extremely nervous. I must give full credit for my table decorations to my daughter, Michele, who gives up her weekends to try to keep her errant mother under control. It was great to meet someone as friendly as yourself. I bought your book, ‘The Big Yank’, that very first day and stayed up half the night reading it. I was so moved by your experiences as a child that I instantly felt a need to protect you, which is a bit ridiculous when you consider the path down which your adult life has taken you. That’s so lovely of you, Fran. When readers get to experience my sequel memoir, they’ll learn about my exploits in different places around the world and how close I came to being permanently horizontal. I’ve used up quite a few (hopefully not all) of my nine lives by this stage, and I believe that somebody has been looking out for me. My overriding memory of that weekend was the way the Irish Wolfhounds (and their owners!) found you. That’s when I first realized that you were an Irish Wolfhound whisperer. FP: As for being a whisperer, I have never thought of myself in that way but I do seem to have a way with animals. I have always loved this ancient breed and that is why they are featured in most of my books. Anyone familiar with my Ballysea Mystery series knows that the Irish Wolfhound, The O’Brien, is the hero of the series. You’ll have to remind me how many books you have published at this stage – it’s hard for me to keep track when you write several every year! FP: Since March 2016, I have published 9 books and have at least two in the works for 2019. I know you have been to Ireland and England many times and also that you are a lady of impeccable taste, since Donegal is your favourite place in Ireland (dare I say “the world?). How did this love affair begin and how do you decide on the locations for each book? FP: You are right, Donegal, is one of my favorite places, if not the favorite. The landscape is so rugged and striking, while unbelievable beautiful. I honestly don’t believe the smile ever left my face during our visit there. Oh wait, yes it did once…when I climbed halfway up Sliabh Liag, before realizing that you could actually drive your car to the top. My Ballysea Mystery series actually takes place in a small fictional coastal village south of there in County Sligo. I am greatly influenced by what I visually observe, for instance, while researching the second Ballysea Mystery we stopped off at Kylemore Abbey and before I knew it the voices in my head were spinning a tale of mystery and fairies and Mystery of White Horse Lake was born. In another instance, I was vacationing in England and visited Wilton Castle in Ross-on-Wye. I walked around the gardens and stood staring across the River Wye to the church steeple of St. Mary’s Church, sitting high above the town, and thought…what a great place for a murder or two and of course you’ll need someone to solve the crimes, so the Chief Inspector Cam Fergus series was born. It’s so good to hear you talk about “the voices” in your head. The voices and the off-the-wall images/thoughts we take for granted as being “natural” is an alien concept for people who do not write, or create. I have wondered if my writing encouraged the madness, or if the madness prompted me to write. I am leaning towards the latter. I recently interviewed another Irish American writer, Frank Vizard, whose latest book “Screamer” is also set in Sligo. As you know, right across the border from Sligo, is Donegal. I may be biased, but I think the rugged wildness of Donegal could be the perfect setting for a modern-day version of “Wuthering Heights”. Just putting it out there! Being modest, you aren’t going to mention it, but I think it is brilliant that your books are reaching a global audience. Can you tell us some of the countries where your books are being read these days? FP: I have to admit that I was pleasantly surprised to see the reception my books are receiving in other countries. I have sales reported from Australia, France, Belgium, Germany, Norway, Canada, Japan, United Kingdom and Ireland as best I can tell. So Fran, can you let us in on any secrets? What might readers look forward to in the New Year? FP: The 5th and final book in “A Ballysea Mystery” series is in the works for 2019 as well as the 3rd Chief Inspector Cam Fergus Mystery. There may be others, depending on which direction the voices in my head decide to take me. I would love to do one set in Donegal so I could have an excuse, as if anyone actually needs one, to return to that magical place. Do you know of anyone that you’d like me to kill off in that book? I’ll have to wait to see who might file a lawsuit against me after my second memoir comes out. I’ll get back to you on your generous offer! Keep in mind that I’ll be in Donegal soon and if you’d like me to do any research, I’ll save my pub receipts! Now, where can readers find your books? FP: All of my books are available on Amazon, Barnes & Noble, Kobo, and distributors worldwide. Kobo has recently joined with Walmart and is also distributing all of my titles. Which Irish Festivals have you lined up for 2019? 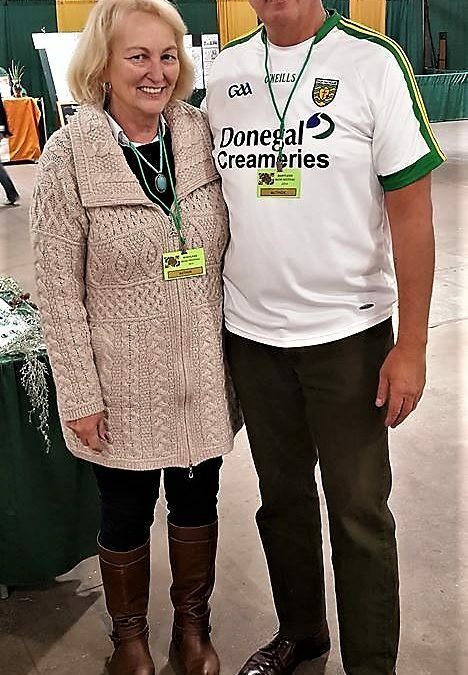 FP: I’m still lining up events for 2019, but I hope to return to the Penn-Mar Irish Festival, the Adams County Irish Festival and the Maryland Irish Festival as well as any others that come along. It’s been fun chatting to you again Fran and I am sure your fan base will keep growing in leaps and bounds. I look forward to seeing you in 2019 – don’t know where, don’t know when! Until then, keep the voices in your head busy. Cheers! FP: It’s always lovely to chat with you JP. 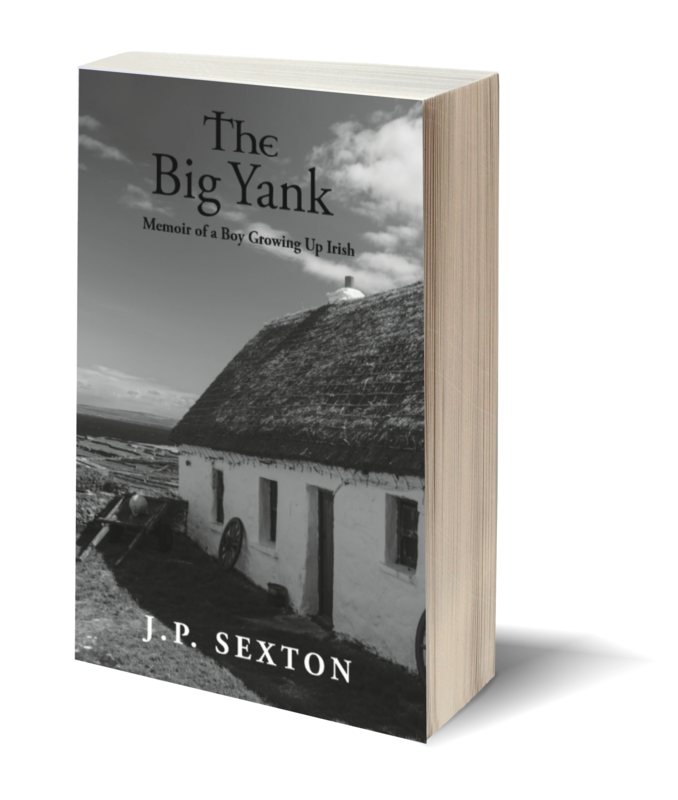 I hope to see you in 2019 and I look forward to the release of your sequel to ‘The Big Yank.’ Perhaps our paths will cross in Donegal at some time in the near future and we can make the rounds to some of your favorite pubs.! Take care of yourself and Merry Christmas to you and all your readers! !